SMOB values each and every team member. We strive to recruit and retain the most qualified, professional, passionate, and hard working individuals in the Permian. Are you ready to tackle daily challenges alongside a competitive, focused, results driven team? Does opportunity to learn, grow, and increase your personal value interest you? Well SMOB is the place to fulfill your goals. We look forward to our future with the best team in the Permian. Join us! SMOB has hired and cultivated countless individuals who have risen through the ranks and reached goals. We are relentless in our pursuit of company goals and with that growth comes new positions and opportunities. SMOB values the thoughts, opinions, personal goals, and team mentality of each of our wonderful team members. Without understanding the vision of each and every individual we cannot succeed in this environment. We love to empower our people and transition their insight into positive action. The oilfield service industry is an extremely fast paced industry with extreme growth. So is SMOB. We understand that in order to deliver the best product we can, we must hire the best people. Nothing feels better than compensating individuals incredibly well for these actions. SMOB trains all employees to meet and exceed not only customer standards, but SMOB standards. We concentrate on making every team member feel prepared to do any job within the scope of our services. A SMOB employee’s personal comfort and belief that they aren’t going to be harmed while completing their job is a top priority. 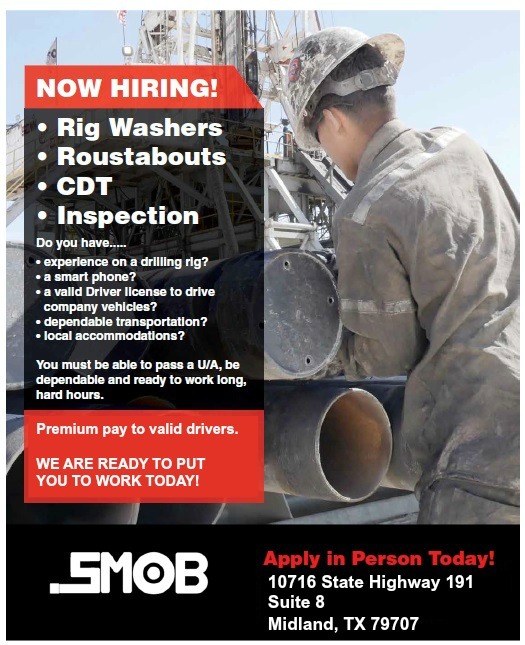 SMOB employs over 200 well versed, valued employees. We have over 130 master service agreements with the top oil companies. SMOB safely deploys over 25 crews a day. We are looking to add 12 new members to our team. SMOB has a spotless safety record. Want to be notified of new job postings?